Jack was born in 1936 to John and Helen Shevinsky Henzes in Peckville, PA. Jack graduated from Blakely High School in 1954 and received a BS in Physical Education from George Washington University in 1958 and MA in Secondary Education from Catholic University of America. 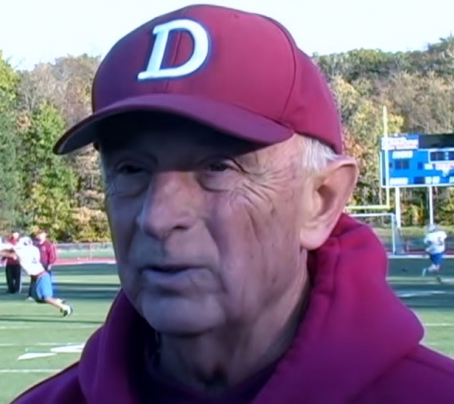 His career started as an assistant football coach at Blakely High School in 1960 under his dad, the legendary “Papa Bear” John Henzes Sr. 1966 he became head coach at Wyoming Area and in 1971 was named and currently is the head football coach at Dunmore (record 435 wins, 160 losses and 8 ties). He currently holds the record for most wins for an active head coach in PA. Teams were Eastern Conference Champions 1985; Class A 1989 State Champions, Class A 2012 State Eastern Champions; Class AA 2007, 2014 State Eastern Champions; District 2 “A” 2012 Champs; District 2 “AA” Champs 1995, 1999, 2007, 2008, 2009, 2014, 2015, 2016, 2017. He was head coach of 1986 Big 33 game; 1985 WNEP Coach of the Year; 1989 – 2014 Coach of the Year for Small Schools; 1989 inducted into Luzerne County Sports Hall of Fame; 1989 Chic Feldman Foundation Hall of Fame of NEPA; member of the “200 Wins Club” of PA Coaches Association (dad a member); 1997 PA State Football Coaches Association; 2007 Channel 16 Coach of the Year; 2009 inducted into National High School Coaches Hall of Fame (dad a member). Currently teaches Physical Education, Health and Drivers Education. He has held the post of department head-Physical Educational Department and currently is co-chair of SADD. Jack resides in Peckville with Roseann, his wife of 60 years and has five children: Kim, Jack, Randy, Melissa and Wendy and 13 grandchildren. He has three sisters: Barbara, Joan and Virginia.